A fen is a wetland system with a permanently high water level at or just below its surface. It’s principal source of nutrients is from surface or groundwater and the substrate is an alkaline to slightly acidic peat soil. The vegetation is usually dominated by sedges. 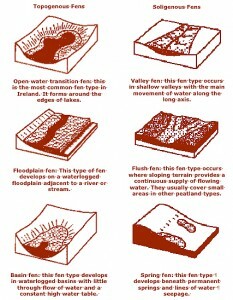 Fens occur throughout the country, most commonly in the west and midlands of Ireland. raising the profile of fens through a social media campaign on the IPCC’s Facebook, Instagram and Twitter Accounts. Fens tend to occur in limestone regions of Ireland where the water supply is sufficiently rich in minerals. They occur throughout the country most commonly in the west and Midlands of Ireland. This map shows the distribution of conservation worthy fens in Ireland. This information is plotted from the IPCC’s site database 2017. 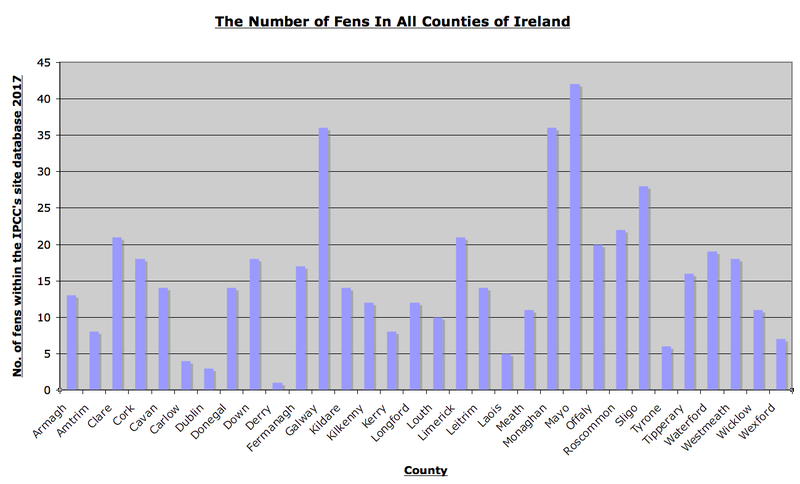 The graph shows the occurrence of fen sites by county in Ireland. 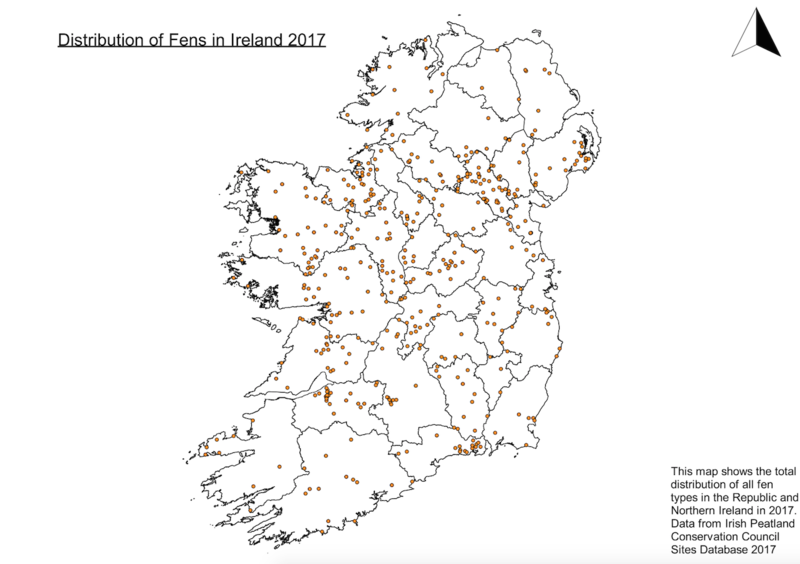 Mayo has the highest number of fen sites according to the IPCC’s sites database with 42 sites. Fens began to develop 10,000 years ago in depressions occupied by shallow lakes in which anaerobic conditions occurred. Without oxygen the complete decomposition of plant material is prevented. In time this un-decomposed plant material forms a thick layer of peat that rises towards the surface of the lake. Eventually the surface peat is invaded by sedges to form a fen. Fens may be subdivided into two major groups based upon their topography and hydrology, they are; topogenous fens and soligenous fens. There are three types of topogenous fen and three types of soligenous fen. Topogenous fens form within basins in the landscape where the water fluctuations are in a vertical direction. Water accumulates on account of the topography. 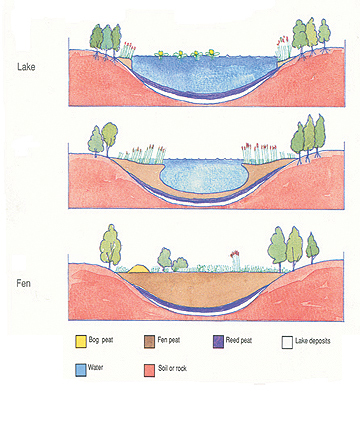 Soligenous fens are formed where sloping terrain provides a continuous supply of flowing water, the horizontal movement of water is more important than the vertical movement of water. Fens can also be classified, on floristic and chemical grounds, into rich fens and poor fens, although these categories may merge. The main difference in vegetation types that occur on fens depends primarily on whether the fen is described as a “rich” (basic) or “poor” (acid) fen. Rich fens and flushes are fed by water that is base-rich or calcareous, and are mainly found in areas overlying limestone. The peat substrate is alkaline. Blunt flowered rush (Juncus subnodulosus) is an indicator species in the vegetation of rich fens. Poor fens and flushes are fed by water that is base poor or acid, but not as acidic as raised bogs. The underlying substrate consists of acid peat. Star sedge (Carex echinata) is an indicator species in the vegetation of poor fens. Between these extremes are transition or quaking fens, which are in between being base rich and base poor. Lesser tussock sedge (Carex diandra) is an indicator species in the vegetation of transition or quaking fens. A fen is often a mosaic of different habitats ranging from open-water, reed beds and small sedge vegetation to semi-terrestrial birch and alder woodland. The complex of habitats that occur within a fen contributes to the rich diversity of plants and animals that find refuge in fens. More than 225 different plants and 635 animals have been recorded on fens in Ireland. 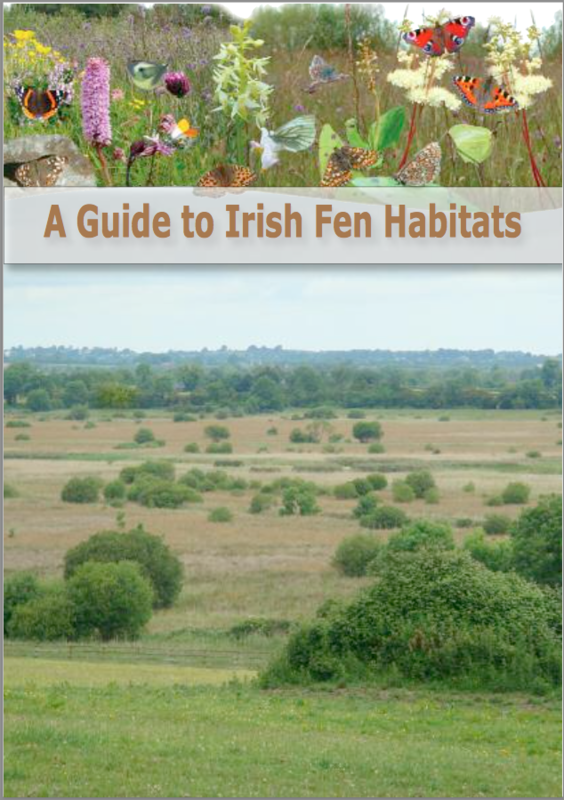 Download the IPCC Habitat Guide to Irish Fens. Watch IPCC’s film about fen habitats below. The original extent of fens in the Republic of Ireland was 92,508ha (Hammond Peatlands Map of 1979). IPCC monitors the status of the resource on an on going basis. Our latest assessment in 2017 as part of the Save Fens – Conserve Biodiversity Campaign indicates that 71% of the fen habitat area has been man-modified to the extent that it has lost its conservation value. The most serious impact on fens has been their reclamation for agricultural land which involves drainage, fertilisation, reclamation and removal of peat. A number of sites of conservation value are secondary fens created by the activity of man. Examples of these are in cutaway bog areas, the margins of raised bogs, the Shannon callows and lake shores where water levels have been artificially lowered. More recent impacts are from enrichment, infilling and dumping, which can destroy a site or seriously degrade its quality. Fens are particularly sensitive to damage from these activities. 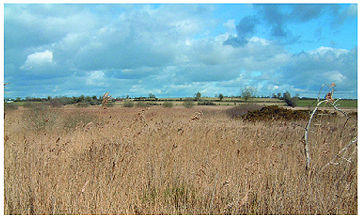 Fens have a high biodiversity of species and habitats. Up to 1000 species have been recorded in fens. Fens act in a number of ways to regulate the environment. Their functions include water purification, flood prevention and carbon storage. The water purification value of fen plants have been put to good use in constructed wetlands which help to clean municipal or industrial waste water grey water and storm water runoff. Fens have a high value for sporting, recreation and fishing as they are often intimately associated with freshwater bodies. Fens are important breeding sites and feeding areas for birds. 45 species of bird have a dependence on fens, 12 of which are listed in Annex 1 of the EU Birds Directive and 43 of which are included in the list of Birds of Conservation Concern in Ireland from 2014. Fen habitats such as Cladium fen, petrifying springs and alkaline fens are all listed for conservation in the EU Habitats Directive. The peat in fens contains an informative record of the past. Under the EU Habitats Directive the National Parks and Wildlife Service (NPWS) are obliged to complete a report every 7 years on the condition of designated habitats. The assessments carried out found that 10 years after the introduction of the habitats directive, no peatland type of priority importance in Ireland is in good conservation status. Fens were given a BAD assessment in this report due to the loss of their area, structure and function. The drivers of the loss of fens include peat mining, draining for cropland, infilling, fertiliser pollution, infrastructure developments and eutrophication. Text, Photographs and Images © Irish Peatland Conservation Council, Bog of Allen Nature Centre, Lullymore, Rathangan, Co. Kildare, R51 V293. Email: bogs@ipcc.ie; Tel: +353-45-860133.